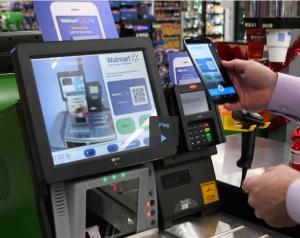 Wal-Mart Launches Apple Pay Rival, Using QR Codes to Enable Payments from Own App–and Without MCX | NFC Times – Near Field Communication and all contactless technology. Wal-Mart Stores, the largest retailer globally by revenue, has launched Walmart Pay, using QR codes to enable payments at its nearly 5,000 U.S. stores. It plans to complete its U.S. rollout by the first half of 2016. Walmart Pay will test whether a payments service usable at only one merchant, even one as large as Wal-Mart, will fly with consumers. Wal-Mart executives said they have built Walmart Pay to later incorporate other mobile wallets, though it remains to be seen how eager Wal-Mart will be to accept competing wallet apps, including Apple Pay. The giant merchant says it has a combined 22 million active users of its Android and iOS apps, and Walmart Pay would be incorporated into these.